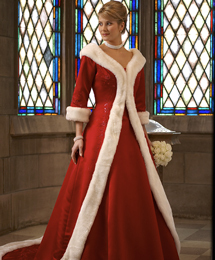 Description: "Matte Italian Satin" gown features a "Synthetic Fur" trimmed removable coat with 3/4 length sleeves and a chapel length train. 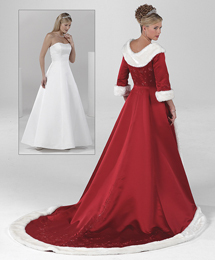 Beaded "Embroidery" complements the coat and neckline of the strapless floor length princess line gown. Includes clean finish hemline, self crinoline, Interior Support System, gripper elastic and optional spaghetti straps.